The Minneapolis Foundation teamed up with Minneapolis Public Schools on Co-Mission, a program that gives students a chance to create commissioned artwork. Next time you stop by The Minneapolis Foundation’s office, look for a series of brightly colored weavings on the wall of our staff café. They’re gorgeous – and you’d never guess they were made by high school students. 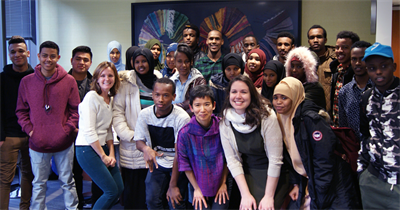 The students, who visited our office this week, take art at Wellstone International High School, a public school composed entirely of recent immigrants. They’re all well into their teens, and yet some of them who grew up in refugee camps had never taken a single drawing lesson before they enrolled in the class. Wellstone’s art teacher, Linda Radius, is just one of the mentors who support these students as they put in the hard work to learn English, graduate, and go on to college and careers. Read the full article on the Minneapolis Foundation website.